Munin is a helpful utility that provides a visual way to monitor a VPS. It is set up to be extremely plug and play. It can be installed very quickly through apt-get. We will be using Ubuntu 12.04 in this guide. First, we will install and configure Munin on a monitoring server, and then we will add configuration options that will allow Munin to monitor a remote server. Munin itself can be installed through apt-get. Once has it has been downloaded, there are very few steps required to get the graphs displayed. The initial configuration will take place on the monitoring server. Start by installing munin on the monitoring server. The munin package contains both the server components and the client components necessary to monitor the machine it is installed on. The server component can be used to monitor behavior across multiple servers, as we will be demonstrating later. Dbdir stores all of the rrdfiles containing the actual monitoring information, htmldir stores the images and site files, logdir maintains the logs, and rundir holds the state files. All four lines should be uncommented. Additionally the htmldir line should be changed to point your web directory. For this guide, we will point it to /var/www/munin. Save and close this file for now. There are a few items that need to be addressed at the top of this file. We need to change both the alias declaration and the directory path to point to the “htmldir” attribute we set in the munin.conf file. We also need to allow connections from outside of the local computer, since you are likely accessing this cloud server remotely. Once all of these changes are in place, you can restart apache and munin to make the changes effective. You don't have permission to access /munin/ on this VPS. 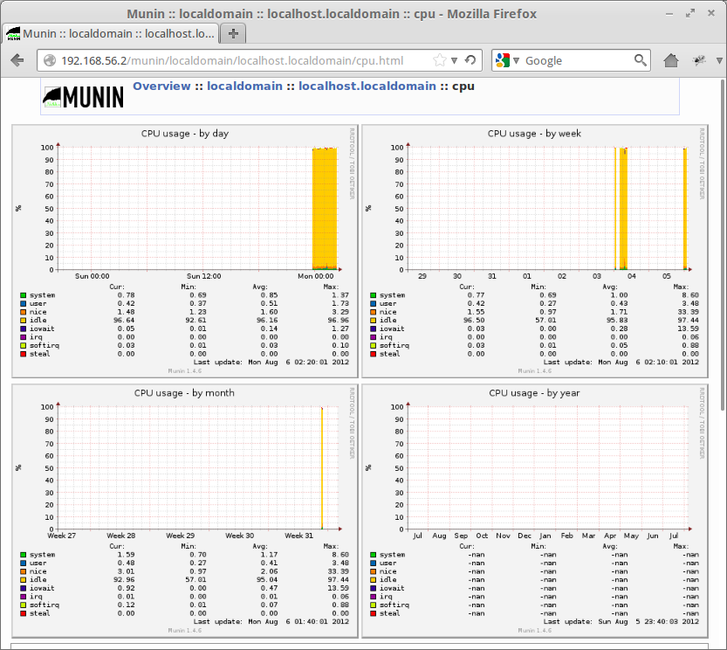 Munin can easily monitor multiple servers at once. The remainder of the article will focus on configuring a client setup that sends its data to the Munin monitoring server that we have configured. This scenario can easily scale to accommodate a number of clients. Log into the client VPS that you want to monitor. Search for the section that has the line “allow ^127\.0\.0\.1$”. 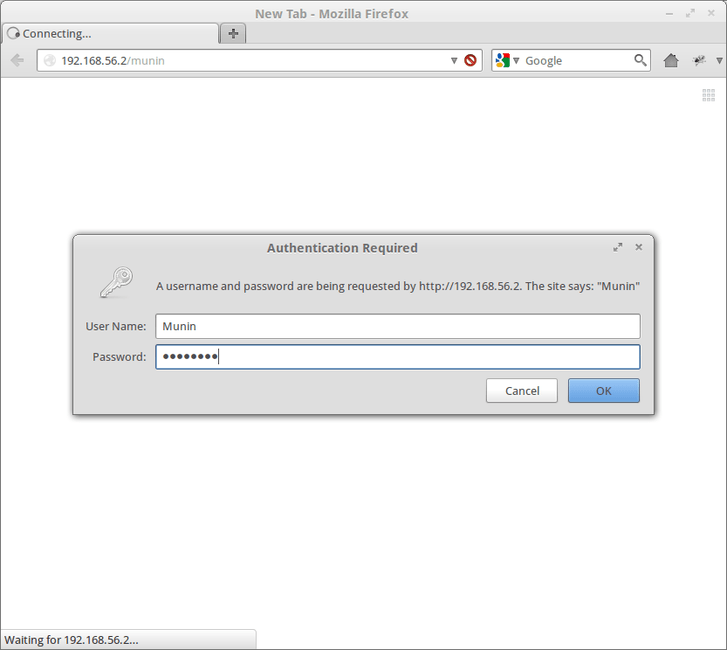 Modify the IP address to reflect your monitoring server’s IP address. You now need to edit the configuration files for the monitoring server again. Log into the monitoring server now. Once again, it will take a few minutes for the correct files to be generated and pulled from the remote client. After a few moments, if you return to your “MonitoringServerIPAddress/munin” page, you should see an option to view your remote client machine. #      close to that set. #      This next part requires mod_expires to be enabled. Enter a password for Munin, restart your apache and munin-node, you’re done!